If you’ve ever shopped for kitchen appliances, you know that KitchenAid maintains a huge presence in the appliance market. Their brand focuses heavily on quality and consistency, and you’ll find their mixers prominently displayed in every major appliance store. Considering this, it’s no surprise that KitchenAid has become a household name. You’d be hard-pressed to find a kitchen without some KitchenAid appliances. And, of course, KitchenAid mixers are so colorful and stylish. Their colors are amazing and so retro that they just draw you in. They are true eye candy and seem to make baking extra fun and chic. But are they really all they’re made out to be? Is it worth considering a lower cost alternative? I’ve taken the time to really dial into the KitchenAid brand in an effort to help you ensure that you’re asking all the right questions. If you are considering a KitchenAid mixer, I hope this information will be helpful in your efforts to ensure your kitchen is powered by the best appliance possible. Why are KitchenAid mixers so popular? KitchenAid has been around for a hundred years. Literally. This remarkable brand first began stirring at home in 1919, making for a century of innovation, marketing and design. Despite this, their mixers remain largely unchanged–there are even components of those original mixers that are compatible with modern machines to this day. Their mixer is so wrapped into American culture that it literally earned a place in the world of modern art as an “icon of American design”. You can see the KitchenAid mixer displayed in the San Francisco Museum of Modern Art. Considering the legacy of this company, its history as an American household symbol, and the enduring design of their products, it is safe to say KitchenAid knows how to make a mixer. KitchenAid is a popular enough brand that it’s certainly not difficult to find, but there are certainly some places where you can find better deals. Typically, Amazon tends to be one of the most competitively priced places to buy things regularly, but they won’t always have the best deals. Because of that, we did research on the best places to buy a KitchenAid mixer so you can shop around. 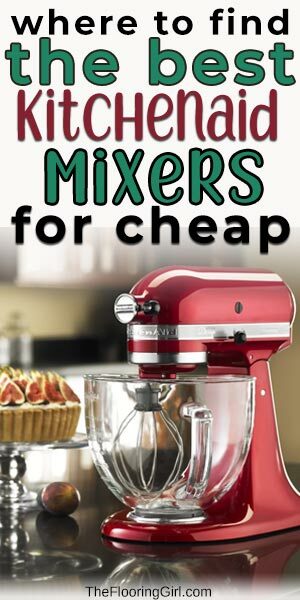 This specific mixer is the most popular with our readers. You can’t go wrong with grabbing your new KitchenAid mixer from Amazon. If you have Amazon Prime, it is likely you can get free (and fast) shipping. This specific mixer has ten different speed settings, includes three attachments, and is the most popular choice in KitchenAid mixers. It is certainly not the fanciest KitchenAid mixer out there, but it’s the most popular because it’s affordable and good quality. Of course, Amazon is not your only option when shopping around for the best KitchenAid mixer. Below we have listed some of our other favorite stores that carry KitchenAid mixers. 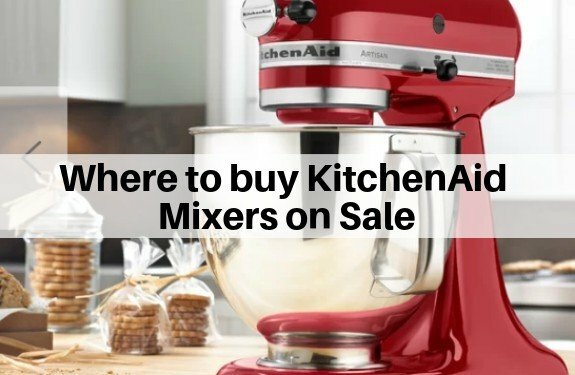 You can find one of the best KitchenAid mixers on build.com (5 quart, comes in chrome). This specific model is a bit more pricey, but that’s because it is fancier than the option we listed above. Although your local Walmart may not have this Artisan KitchenAid mixer in stock, it’s easy enough to order online. For some products, you can get a discount for picking it up in store, so it’s worth looking into if you are looking to save some cash. This classic KitchenAid mixer is a great deal from Target. It’s the most popular KitchenAid Mixer among Target shoppers, and you can often find it on sale! This KitchenAid mixer is a limited edition from Williams Sonoma. We thought this mixer was absolutely gorgeous and would be a great addition to your rustic decor. Look out throughout the year for a good deal on this KitchenAid mixer from Kohls. Although Kohls is not historically cheaper, they do tend to run good deals for most holidays. Wayfair is a great place for anything home decor – and their selection of KitchenAid mixers are great. They often hold sales or have coupons available, so it’s a place worth checking. Hayneedle is another higher-class place to do your kitchen appliance shopping. This custom metallic series KitchenAid mixer is a beautiful copper color that would add a classy touch to any kitchen. What is the best KitchenAid Mixer to buy? The question of which KitchenAid mixer to buy is definitely worth some consideration and deliberation. KitchenAid boasts two major stand mixers, the tilt-head and the bowl-lift. As you can imagine, their classification refers to the functional nature of its use. The tilt allows you to roll the head up to get your bowl in and out; the bowl-lift drops down to allow access. Either option is great, and more a question of mechanics than functional performance. Consider your space. Do you have a cupboard for storing your KitchenAid mixer? Will you be working under cupboards that might inhibit the rotation of the tilt-head? Second, you’ll want to decide if you need the Professional KitchenAid mixer or if the Artisan KitchenAid mixer is enough. You can also consider the Classic KitchenAid mixer if your needs are very basic. We’ll get into more detail a little later. For now, consider that the Professional is more powerful, heavier, and sports a larger mixing bowl. Once you’ve identified the type of KitchenAid mixer you need, you’ll want to consider color requirements and the size of bowl that best fits your needs. The Professional KitchenAid mixer is generally the best. It also tends to be the most expensive, and for good reason. The Classic KitchenAid mixer is a great introduction to the world of KitchenAid, and it’s the most affordable option. The top part of this mixer tilts up, allowing for easy access and cleaning. This Classic KitchenAid comes with a 4.5-quart bowl. The Artisan Design mixer is the next step up in KitchenAid mixers. It’s a little more expensive than the Classic, but it’s also bigger with a little more style. This mixer comes with a 5-quart bowl and vibrant color options. The Professional 600 series is for serious cooks and is not necessary for casual cooking. These mixers can comfortably mix up to thirteen cups of flour and can be used for professional results at home. This mixer has an impressive 67 touch points for better mixing. This Pro KitchenAid mixer is considered one of the top choices if you are looking for the best quality. You can fit up to 16 cups of flower in this 7-quart mixing bowl, which makes it the largest residential bowl-lift mixer available on the market. The KitchenAid Ultra Power Mixer is a step above even the Professional model. It has a similar design to that of the classic series. The big difference with this Ultra Power Mixer is that it includes a more powerful motor that can handle dense ingredients easily. It also includes some heavy duty steel agitators. It’s important to note that this KitchenAid mixer comes with only a 4.5-quart bowl, and should be purchased specifically for using with dense ingredients. Which KitchenAid Mixer is most powerful? Wattage is important with a mixer because the torque necessary to mix a heavy dough can be incredibly taxing on your appliance. If all you mix are thin products like creams or potatoes, you can easily get by with a lower wattage. The Professional KitchenAid mixer line has the most powerful machinery. The Pro 600 series boasts the strongest motor at 600 watts. The 500 series gives a little less push at 575, while Artisan and Classic units run closer to the 200-300’s. If you intend to frequently make a sticky or tight dough, you’ll find that some of the less powerful units might struggle over time. For this reason, I’d absolutely recommend that you think forward. What do you currently cook? Are you planning on extending your reach a little in the kitchen? Plan ahead to ensure you’re considering all the uses to which you’ll put your KitchenAid mixer. If there’s any doubt, remember that it’s better to have too much power than too little. These machines don’t tend to depreciate in value, but I’ve always preferred to buy it once, and buy it right. Err on the side of the Professional KitchenAid mixer if there’s any question as to the uses to which you’ll put this appliance. If you need nothing but the most powerful, watch for the NSF Certified 8-quart bowl lift, which is the top of the line. This is technically a Professional KitchenAid mixer, but comes with the larger bowl and a whopping 1.3 horsepower motor. While that might not sound like a lot in today’s landscape, just take a minute to think literally: you have a whole horse turning your dough. The KitchenAid mixer comes in a variety of beautiful and aptly named colors. For a company that names its mid-range product “artisan,” you can assume the marketing for something aesthetic like color would certainly not disappoint. These aptly invoking options pose you with two alternatives: you can find the color that best suits your kitchen theme and decor so your KitchenAid mixer blends flawlessly into the whole. Or, alternatively, you can choose the color that stands out, making of this mixer a centerpiece or accent point. 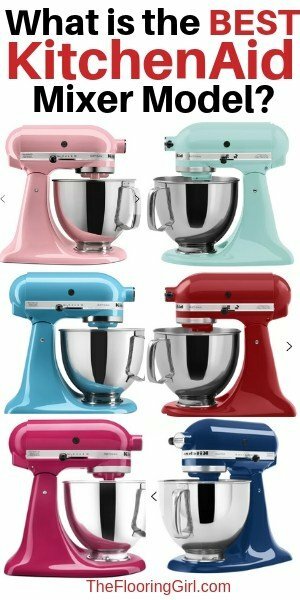 KitchenAid’s website currently shows about 80 color options for stand mixers. KitchenAid named “Bird of Paradise” their color of the year for 2018. This smooth shade of pink scrapes with subtlety at the outward edges of orange while remaining vibrant and pleasant. You will probably have the unit for life, but it’s hard to regret any of these beautiful colors. Pick the one you find the most pleasing. You won’t regret it, regardless of your choice. As mentioned already, Artisan falls into the low to middle grade of KitchenAid mixer options. To be sure, the Artisan is still a fantastic machine. Professional is a step above, giving you increased power and larger bowl capacity. Artisan offers a Mini version at 3.5 quarts, Classic comes at 4.5 quarts. The standard Artisan gives you 5 quarts, and the Professional KitchenAid mixer offers the maximum 6 quarts. Because of the limitations in design, the Professional comes only in bowl-lift style. The solid head of the bowl-lift allows for a sturdier and more robust design, which allows for more torque. This is where the additional 100-200 watts comes in, making the Professional superior in size and power. Yes. KitchenAid has placed a lot of emphasis on backward compatibility with their hardware and accessories. One common accessory for which users seek compatibility options is the 5 quart glass mixing bowl. As you can imagine, there’s no question as to whether or not this 5 quart bowl can be used with the standard Artisan, which features the same bowl. However, this bowl is compatible with basically any tilt-head mixer. The exception is the Accolade, which is a 5 quart mixer similar to the Artisan, but which was designed with a tighter frame. The 5-quart bowl may also be too large for the Artisan Mini, but this was difficult to confirm without trying it personally. Overall, finding the right KitchenAid mixer at the right price begins with understanding your own needs. KitchenAid has provided a wealth of options and a beautiful palette within each model. The longstanding history and enduring design make KitchenAid worth the price. 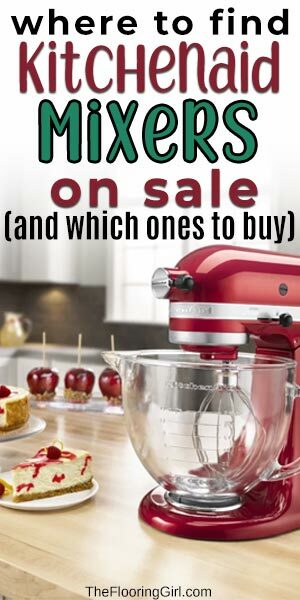 Take advantage of some of the great deals we’ve identified here and find that perfect KitchenAid mixer to complement your baking needs.